Apple is planning to offer subscriptions to select streaming TV and video services through its dedicated TV app that's available on the iPhone, iPad, and Apple TV, reports Bloomberg. 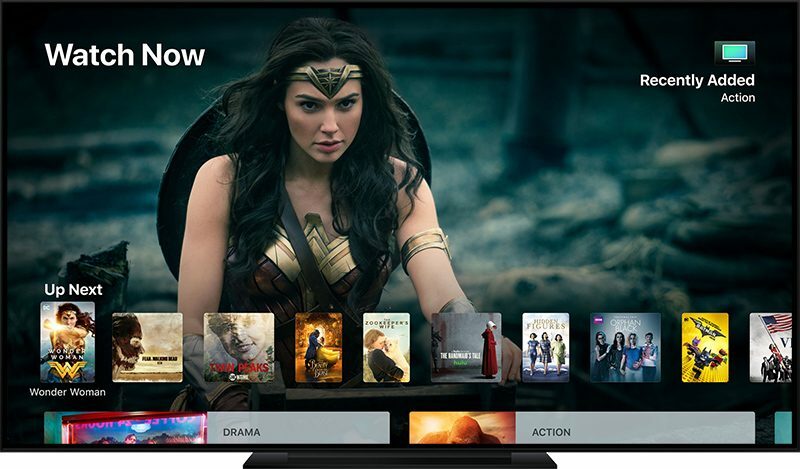 The TV app already aggregates television and movie content from a range of different providers into one easy-to-access place, so offering subscriptions is a natural evolution of Apple's efforts to simplify and improve the television watching experience. Right now, while you can access content from hundreds of apps and cable providers, many require a premium subscription that must be obtained directly from the provider. Services like HBO, Showtime, Starz, Netflix, and more, for example, all require subscriptions, which must be purchased from within a third-party app or website. Apple is going to offer the TV app subscription options as an alternative to requiring customers to subscribe to various video services from multiple apps and content providers. It will streamline content acquisition for customers, but it will also bolster the company's rapidly growing services business. Apple is said to be planning to introduce the new subscription feature "in the next year." There's no word on how Apple's own original programming efforts will factor in to the subscription service. Apple has more than a dozen television shows in the works, and at the current time, it's still unclear whether Apple is building a dedicated service for the content or if it will debut on iTunes or Apple Music. It seems like everybody want you to "subscribe" to their stuff, nowadays. Subscribe to TV, movies, music, recipes, cooking ingredients, food, blogs, books, audiobooks, delivery services, software, etc., etc. Subscription services will bankrupt us all. If this turns in to an a la carte cable type subscription system, I'd pay per channel if the price is right. Can someone explain why Apple deserves 30% or 15% of a monthly fee I pay to Netflix or Hulu? Apple doesn’t host the content or do any marketing on behalf of these companies. And if they could offer their own payment system in-app they would. If the argument is without Apple’s platform these companies/services wouldn’t exist then why isn’t Apple taking a cut of every Uber or Lyft ride? People keep complaining and listing all of the things that Apple doesn't do. What Apple doesn't do is irrelevant. What Apple does is very relevant, and Apple does most of the things for HBO that Comcast did. In fact, if HBO's app simply collects payment outside of the Apple ecosystem, like HBO does right now, then Apple gets nothing at all. So Apple is currently providing all of those services listed above, for free. Only if HBO charges through the Apple ecosystem does Apple get any cut at all. It's a bit weird to me that people think this setup is outrageous or unfair. I assume they just haven't really though it through. Can you imagine Comcast letting HBO onto their system for free? It's absurd. P.S. Apple's cut is the same as the Google Play Store charges for subscriptions, but everybody seems to question Apple alone. I get that we are on an Apple blog in an article about Apple devices, so that's okay here in this context. But I see it in the general blogosphere too, which seems unfair and biased against Apple. This is like Apple bringing a stock Civic to a race that Comcast, AT&T, Sling & others have been racing with race-modified Supras for a few years already. Apple had more than FIVE YEARS to get TV right. That same TV app just hung in there, useless, featureless for ages. Everyone hates the ATV TV app, no one uses it for any reason. Each attempt at watching a TV show would ask you to re-sign in and to download the app from each content provider. You'd be hard pressed to find a worse design. And this is how their new take on the TV model? Which executive is responsible for this? I use the ATV TV app quite a bit. Just used it now to watch Deadwood on Amazon Prime. No sign in or download needed, and it even took me to the exact place I was watching before. Just sayin'. It seems like everybody want you to "subscribe" to their stuff, nowadays/.../Subscription services will bankrupt us all. I'm increasingly grateful that my parents imposed a limit of one magazine subscription per year to spend our lawnmowing/snowshoveling money on, as kids. There were several useful lessons in that, which I didn't fully appreciate at the time, but do now more and more as an adult. Netflix is the one subscription service I spend $ on. It used to be Dropbox. If Netflix doesn't figure out how to put a decent Sci-Fi adventure series out in the next couple years, I think it will be a season pass to the ballet, or local theatre company. The quantity is lower, but the quality of a live stage performance positively spanks digital media in every way. You should see the resolution of the graphics in a stage production. It's so clear it's like actually being there. Would love to see them bring the TV app to the MacOS! Everyone hates the ATV TV app, no one uses it for any reason. Hey, you didn't ask me! I happen to like ATV.